One of Karatbars people who I got to know in 2016 just sent an update on what’s coming this Friday. Zoltan Vass, with an extensive experience in Forex trading and cryptocurrency trading will be giving a talk. Here you can learn more about Zoltan and the event itself. The topics include Bitcoin, crypto market, Karatbars, KaratBank Coin (KBC), KaratCoin Bank, KaratCoinBank coin (KCB). KaratBank Coin (KBC), KaratCoin Bank, KaratCoinBank coin (KCB)… yeah, pretty confusing. So, let’s go over these quickly. I already talked about KaratBank Coin (KBC) here. Basically it’s a currency backed by gold (partially at the moment; should be fully backed by gold sometimes in 2019). KaratCoin Bank is something new. It opened in Miami on July 4. It’s a crypto bank. The first licensed crypto bank in the world! It will be offering KaratCoinBank coin (KCB). To learn more about KaratCoin Bank go here. Or watch this video. KaratCoinBank coin (KCB) is a blockchain-based cryptocurrency. To learn more about KaratCoinBank coin (KCB), watch this video or go here. KaratCoinBank coin (KCB) and KaratBank Coin (KBC) go hand in hand – they complement each other. The KaratCoinBank ICO (Initial Coin Offering) is currently active. To buy KCB tokens go here. To participate in the above – the ONLY GLOBAL GOLD PAYMENT SYSTEM – start by registering here (scroll down). Free or paid accounts are available. 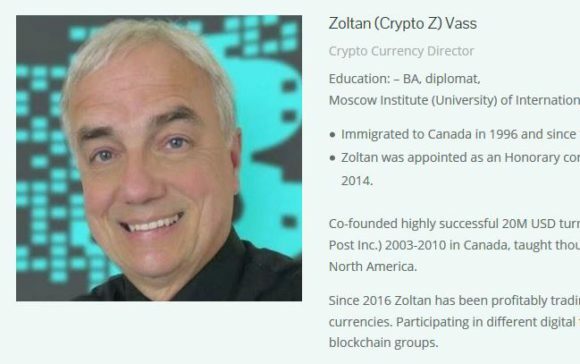 A 5-language diplomat, Zoltan received his education in Moscow University of International Relations. He speaks in the world’s most advanced political / business meetings and educational gatherings. He is a member of numerous blockchain groups.